Co-design practice by IMA and Boehringer Ingelheim for the new capsule filling installation of ADAPTA 100 with 100% direct fill weight control. In 1948 the first commercial dry powder inhalation device was launched on the market. This first technology seems archaic by today’s standards: a deep breath in would cause a ball to strike a cartridge containing powder and shake the powder into the airstream. Since then, changes in the drug delivery market and regulatory pressures have driven innovation of Dry Powder Inhalers (DPIs) forward. Firstly, the introduction of capsules has meant standardized filling technologies can be incorporated into the manufacturing process, thus meeting the needs of large-scale industrial filling of such devices. With the availability of accurate filling technologies, it is possible to manufacture DPIs on a large scale to meet worldwide volume needs at acceptable costs. Afterwards, the 1987 Montreal Protocol, which called for minimizing the chlorofluorocarbons (CFCs), diverted market interest away from CFC-propelled Metered Dose Inhalers (MDIs) to DPIs. In the end, healthcare reforms in fast-growing economies did the rest. The availability of low-cost, patient-friendly DPI options encouraged their use also in Asia and Latin America, where MDIs are often still preferred because they are considered more cost-effective. It is estimated by the WHO that, worldwide, some 300 million people suffer from asthma and 240 million people suffer from chronic obstructive disease (COPD). DPIs represent 50% of the total asthma/COPD market by value worldwide. The latest patient-focused studies using DPIs indicated that the expectations regarding this technology have evolved. Patients and pneumologists are now increasingly focusing on convenience and ease of use, favoring a compact design. Indeed, DPIs have shown great promise in their ability to deliver drug reliably and effectively, and novel designs can ensure that future cost, compliance and safety challenges are overcome. Some of the performance characteristics essential to DPIs are related to dose delivery, fine particle fraction content and performances at varying airflows. These characteristics can vary from one powder formulation to another, and some fine tuning of either device or formulation or a combination of both may be necessary to achieve optimal performance. Micro-dosing DPIs takes this challenge to extremes. IMA and Boehringer Ingelheim have joined forces in order to achieve a high-precision capsule filling system, thus ensuring accurate and efficient filling of tiotropium bromide inhalation powder. What were your requirements for the new capsule filling machine? Which were the criticalities of the product manufacturing? We had a bunch of requirements. The machine had to be GMP-compliant and easy to clean, fast to set up and easy to operate to make production run smoothly. A small overall footprint to be able to use existing GMP rooms was required. The machine had to be as standard as possible and with less customization as possible to reduce total cost of ownership; for example, with availability of spare and wear parts. We were looking for good capsule handling and performance, accurate dosing and high speeds to produce excellent quality with reasonable costs. Overall, which was the most restrictive requirement? Our most important requirement was to have a 100% control system of fill-weight. The process is complex due to the micro-dosing we run. The very small amount of powder in combination with the very high accuracy of dosing we must fulfill made the challenge for IMA. Adapta uses two scales to measure tare and gross weight and then calculate the net dosing. There are some striking arguments for gravity-based measure systems in comparison to other principles like capacitive mass determination. Scales as a system are very well known. Its measure principle is easy and direct to calibrate just by placing a weight on the scale. It is simple to explain the function within the Boehringer Ingelheim organization as well as to authorities. The scale supplier Wipotec is known within our pharma production. Their systems are widely used in the industry and known for their reliability. Which areas of the machine were co-designed with IMA? We started with some preliminary tests that showed, at an early stage, that the machine was very well capable to handle our capsules. We also saw that the dosing was working for our product. There were issues concerning the accuracy and resolution of the scale. We worked together with IMA and Wipotec on this subject and found a solution. The scale has now a resolution of 0.01 mg and the dynamic parameters of the current closed loop control have been optimized. We also made changes on the timing for the weight sampling. We set the calibration weight to 100 mg and developed special weights that lay perfectly on the cells and can be handled in a good manner. We determined the maximal speed of Adapta 100 to optimize the accuracy. In addition, tests with different diameters of the dosators were done. We also designed together an ejection control system to be 100% sure bad capsules are thrown out and detected on their way to the reject bin. A second mechanical stop mechanism was developed and additional sensors were needed to be installed. Of course, the software of the machine needed to be updated to make sure there is never ever the possibility a bad capsule goes along the good capsule path. At the end, the mechanical solution has been an additional flap and twelve light barriers as sensors. At the beginning, it was a bit hard to reach a common understanding of the requested process. Once we realized that we all have the same goal, working together has gotten to a very pleasant stage. We discussed a lot of possibilities and solutions. Most of the time we agreed on the best technical solutions and sometimes we needed to settle with compromises. I guess IMA and Boehringer Ingelheim produced the best result. 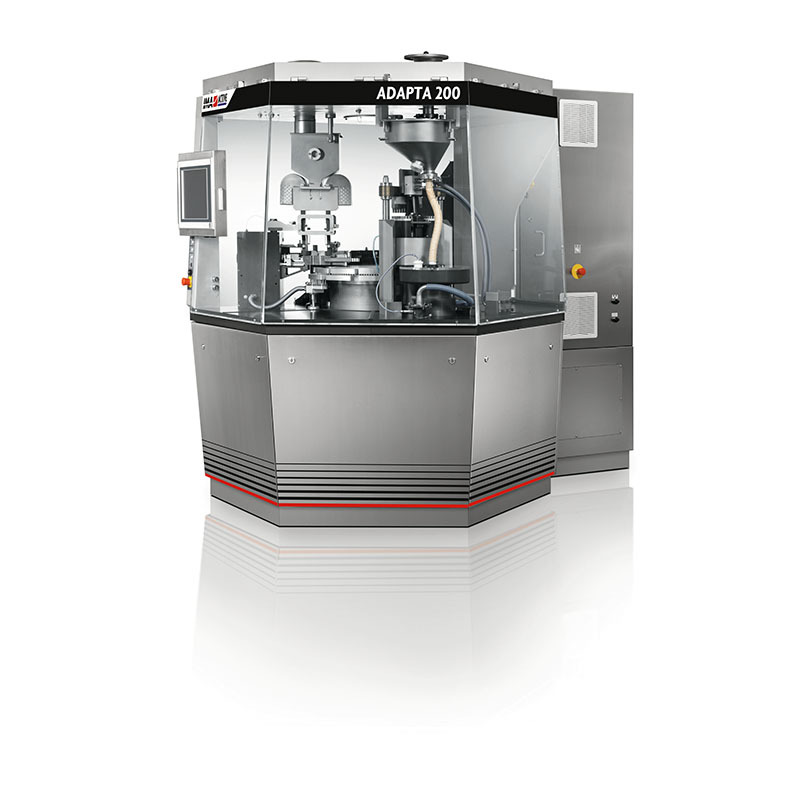 Which three main criteria do you appreciate the most in the Adapta capsule filling machine?